t*rexes and tiaras: If I learned to play the violin, And I traded my old guitar in.. If I learned to play the violin, And I traded my old guitar in.. 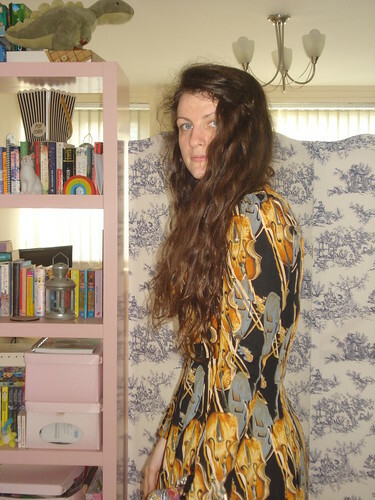 I rather like the print on this dress, despite the fact that I don't have a musical bone in my body. 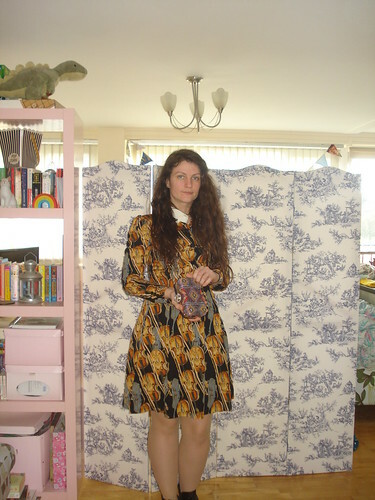 Thankfully it was a little longer than the last dress I ordered from Oasap; I was pleasantly surprised when it arrived. I didn't actually wear these boots during the day, but had a site meeting to go out to in the evening so I changed footwear for that, as the track from the car park I was going to is always quite muddy and I didn't want to get my IC flats from earlier in the day dirty. 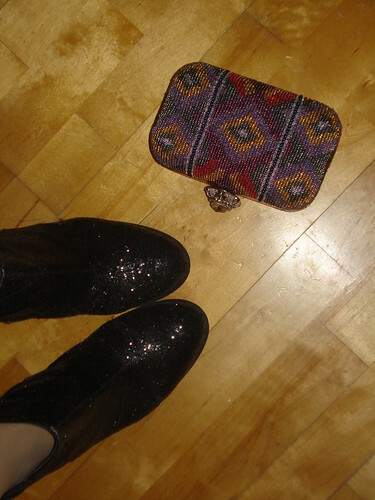 I was pleased to have a chance to take this cute beaded clutch bag with me, as well. A Christmas present from my best friend, it's big enough for the bare essentials, which to me are my phone, keys and some cash for the car park. I'd love to use clutch bags more often, I just find that I'm a bit hopeless at travelling light. I had to buy a new purse recently because my previous one (aside from the fact it was falling apart) was just too big for just about any of my small handbags. I've been making more and more dresses lately, which is exciting, and I've definitely more than covered my new year's goal, but I'm thinking that I'm going to save wearing most of them for the moment. I've signed up to take part in Me Made May, which is all about wearing items from your handmade wardrobe, so I'm rather looking forward to putting some outfits together for them! Is anyone else taking part? I usually find their dresses to be far too short, so I was glad that this one is a decent length on me - I'm not even that tall! 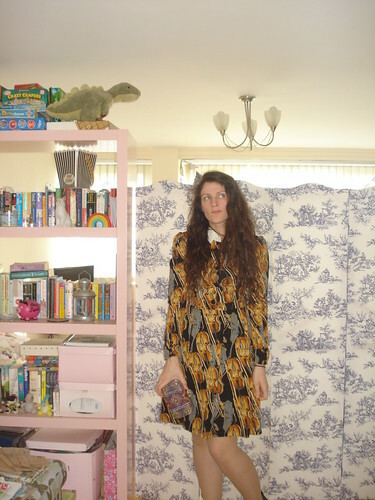 A decent length of dress is so hard to find. This dress is cute, I played violin until I was about 15! Oh, I never really played any instruments as I just couldn't ever pick up how to read music. I love the print of this dress Char, so unique! It's cute, I don't think I have anything with violins on it so I was happy to add to my wardrobe of patterns! Amazing dress! I also really love the screen behind you, what a nice backdrop! Thank you, I'm super glad to be able to find a use for it, it's been sitting neglected for a while as there wasn't really a space for it for a while until I moved the furniture around a bit.